Description - Add a little uniqueness and pizzazz with our Weave Carpet Tiles. Great as a whole floor or custom rug, these carpet tile squares are the perfect alternative to standard carpet in your home or business. Installation of these peel and stick carpet tiles is simple, just peel the plastic backing and place the tile on the floor. With a high quality releasable adhesive, removal of these carpet tiles is a breeze. Unlike cheaper peel and stick tiles, these commercial carpet tiles will not leave a residue when removed. 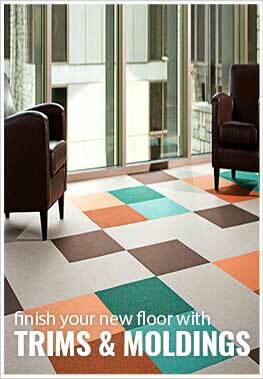 Backed by a 5 year warranty, these modular tiles are resistant to mold, mildew, staining, soiling, and wear. Recommended Installation Pattern - 1/4 Turn (Parquet). Material - 100% Eco-fi PET fiber with a peel-and-stick backing. Recommended Uses - Weave Carpet Tiles are the perfect alternative to standard carpet and area rugs, and are commonly found as flooring in living rooms, basements, family rooms, bedrooms, in garages, home offices, as office flooring, in small businesses, as spare room flooring and much more. In wall to wall or rug installations, tiles can be loose laid and cut into place with a straight edge and a utility knife. Each tile has a self-adhering back that secures each tile to the floor without the need for glue, tape or tacks. If you do experience some movement and would like to ensure that the tiles do not slide at all, some double sided carpet tape can be used around the perimeter of the floor and directly under the seams of the tiles to prevent any movement. For complete installation instructions, please Click Here. Stain, soil and wear resistant. Releasable adhesive. Leaves no residue on surfaces. Will not fray, zipper, wrinkle, or unravel. Won't stain or friction burn like other products. This product is incredibly versatile, and can be installed virtually anywhere! Built to stand up to the harsh outdoor elements, but also comfortable and attractive enough to be used indoors, this product really does it all. This carpet is not only durable and eco-friendly, but it is also naturally resistant to any mold, mildew, and the odors that they cause. Installation is a breeze with this carpet. Easily cut to fit your unique space, and don't worry - it won't unravel on you! These tiles do have an adhesive back and would not be recommended to put directly onto wood flooring. You could create a floating subfloor to adhere the tiles to instead. Can these carpet tiles be used on a terrace that could get some rain? Yes, these tiles are approved for outdoor use and the elements. Put down in the pool table area in our bar, looks great, and is doing well in a high traffic area. Great purchase, everything looks great. Great tiles that were easy to assemble. I like the basketweave pattern. Product seems to be well made. Very easy to install. Ordering, shipping, and delivery were all handled quickly and easily.